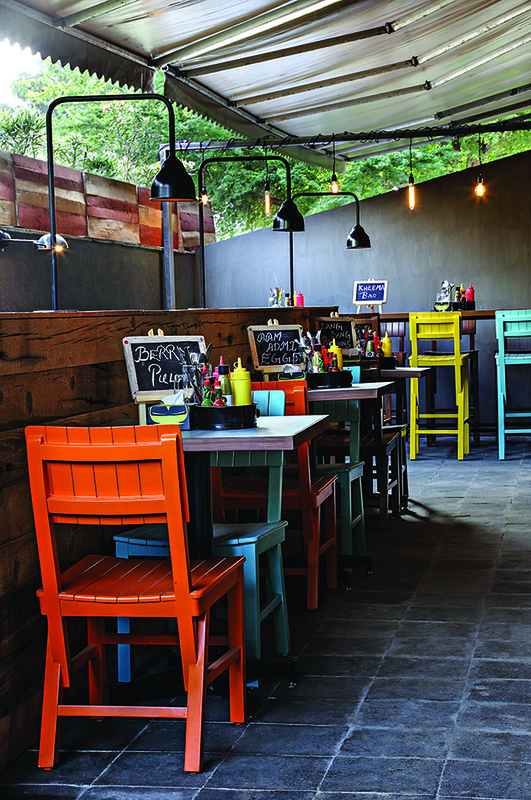 Monkey Bar, designed by architect Jatin Hukkeri, gives Mumbai its cave to have conversations, relax and unwind. With its semi-industrial expressions and fusion food, drink and decor, the space is modern and global, yet hyper-local, all at once. All four elements happening in equal measure â€” the cuisine, the wine, the service, and the overall ambience. 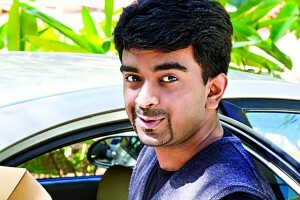 It teaches that dining could happen at a deeper level. 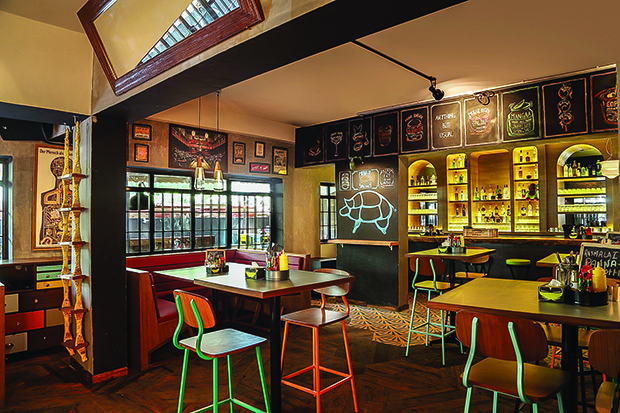 The brainchild of Chef Manu Chandra and Chetan Rampal, Monkey Bar, claims to be Indiaâ€™s first gastro-pub with a menu thatâ€™s a creative amalgam of Indian and Western cuisines. Bandra is third in line after its cognates at Bangalore and New Delhi. 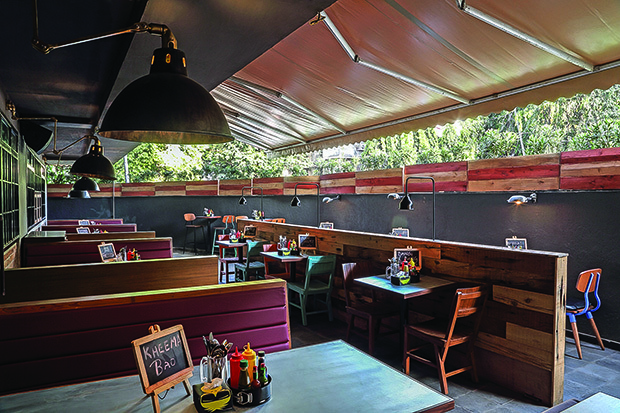 With a design aesthetic drawn from the themes of its parent outlet, architect Jatin Hukkeri who heads design firm Workroom for Architecture+Design (WAD) in Bangalore â€” well-established in the food and beverage industry â€” craftily treats Monkey Bar as yet another element of the Jungle Gym. The architect was given a brief to create a hang-out place that would synchronize with the other Monkey Bars, yet have an identity of its own that would reflect its location â€” Mumbaiâ€™s hip suburb of Bandra. 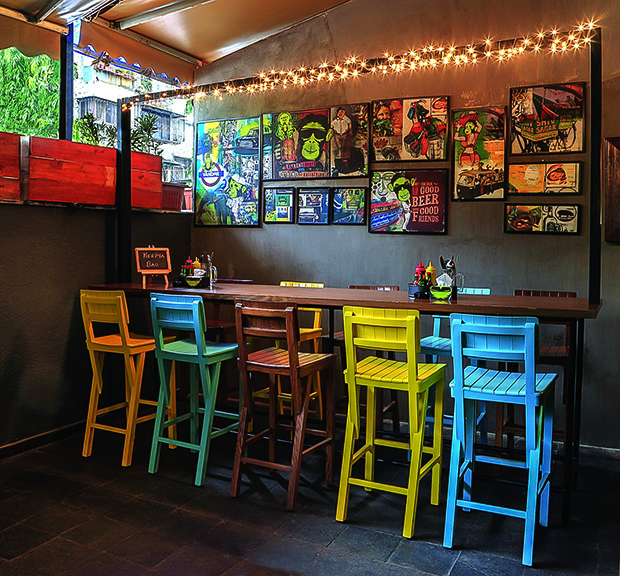 In the interiors, the desi local feel of Mumbai is commenced with graphics and the play on the word bundar (a harbour) with Bandra instantly places you in an ambiance that reflects a playful vibe and is in tune with the buzzing island city. The design of the 3,500 sq ft internal and 1,500 sq ft outdoor seating space features a play of metal pipes, ropes, geometrical-shaped quirky furniture, creating a chic, semi-industrial environment. The high activity zone of the Monkey Bar is marked with a play of wooden-metal furniture, graphics, art works and lights. Ambiance can affect everything from perceptions on responsiveness and reliability, how much and how and what customers eat or drink, how much they spend, how long they stay in the restaurant, and their likelihood of returning and much more. 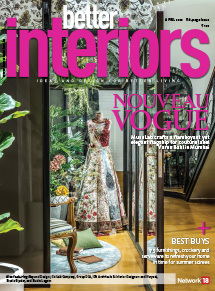 He strived to connect the interior spaces with the local context of the urban, cosmopolitan way of living in Bandra. On the exterior, just outside the entrance, is a clever wall art with the brandâ€™s signature monkey and the citizens youâ€™re likely to encounter in a typical Mumbai local. “The prime activity zone is that what you feel beyond the green glass and metal door,” says Jatin. With a kitchen exit to the right, the cosy interiors are highlighted by a mirror to create an illusion of a larger space. The entry into the activity zone opens up vistas towards varied design elements with patterned hexagonal tiles seamlessly transitioning into wooden flooring and the self-lit bar. The bar, bang opposite the entrance is what catches your eye. The classic bar, replete with antique glass lamps and a giant bevelled mirror to its right forms the focal point of the space. It is finished in teak wood, trim and glass where the rawness of the wood and arches give a warm look. The mirror at the rear renders the unit voluminous. A series of strip LED lights running along the wooden shelves illuminate the bottles in a way that lures you to try something unusual. 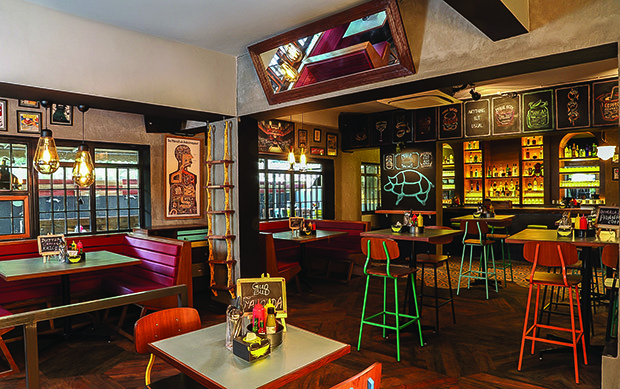 The dining area is a composition of wood and multi-hued metal and the graphics adorning the wall â€” thoughtfully designed to reflect Mumbaiâ€™s culture â€” demand a conversation by themselves. 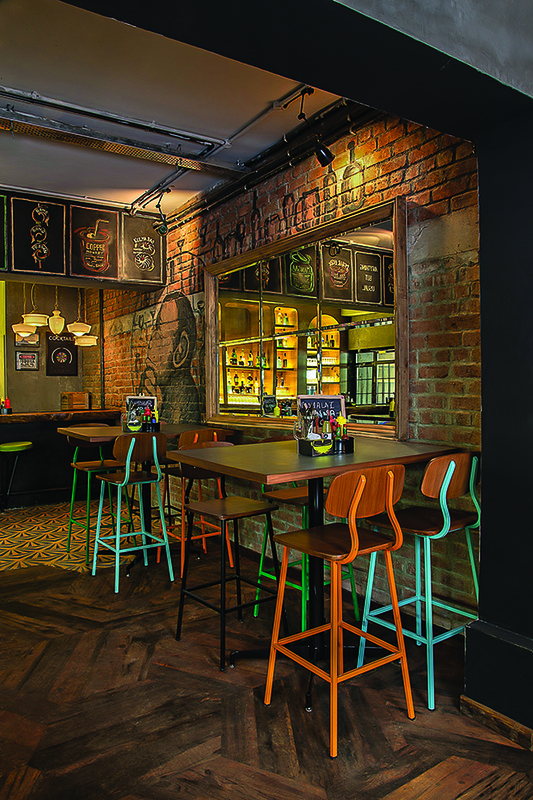 The same quirky thread of the interiors is carried over to the outside seating with high bar chairs and monkey graphics. The comfortable chairs-and-table, the high bar chairs, the banquet bench seating for larger groups and the swivelling bar stools all in shades of olive green, red and cheery yellow, with bits of electric blue highlights, form the broad range of seating options. 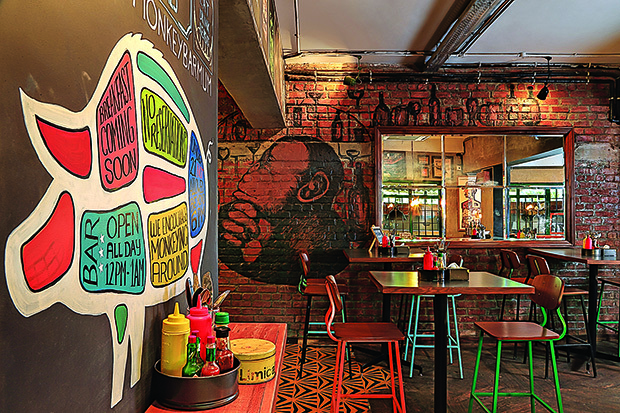 On the walls, exposed brick is juxtaposed with polished plaster, some featuring bold monkey graffiti created by artist Shaambhavi, a graduate of Bangaloreâ€™s Srishti School of design. The eclectic lighting fixtures that hover over the wooden tables are contained, bare Edison bulbs suspended from vintage wires. The bulbs, lighting fixtures over the bar and the larger fixtures that extend on large brass arms in the exteriors are all a product of an artisan from Mumbaiâ€™s famous Chor Bazaar. 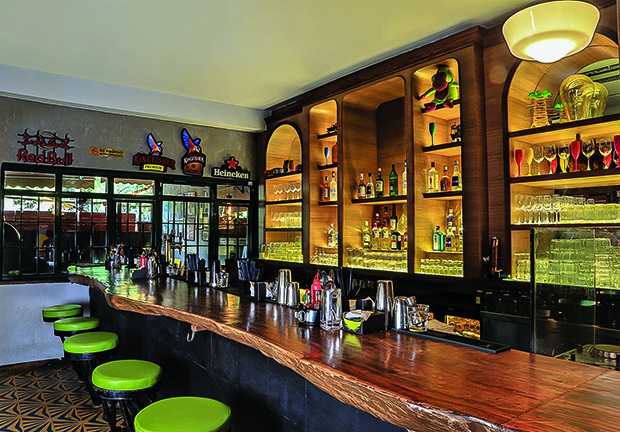 The old beams over the bar and columns are concealed using exposed concrete finish, black slate paint, lighting fixtures, graphics and frames of signature delicacies and cocktails. The architect has been successful in evolving a classic timber and a leather-pub atmosphere. The all-day restobar has vividly bordered windows that invite in sunlight and give you a glimpse of the outside. The designer grills lead you to the outdoor area. The same quirky cosmopolitan Mumbai lingo is carried out through the Cudappah flooring. This space is shaded with retractable awnings limiting the harsh sunlight and a wooden low-height partition wall divides the seating area. There is also a wooden partition with smaller tables to either side, perfect for tables of two. Here, seating for two and banquet seating share space with a foosball table to keep you entertained while you wait for your meal. A wooden partition with a retractable beige awning divides the seating outside, shielding one from the sunlight, yet giving a complete view of the lush greens. A jungle gym is composed of definite and countless shapes designed in wood and metal, making it as much a work of art as a means of enjoyment. With well-chosen wall finishes, hand-picked graphics and accessories, the architect has successfully created a space that conveys a sense of being in a warm warehouse while firmly remaining modern and on-trend. 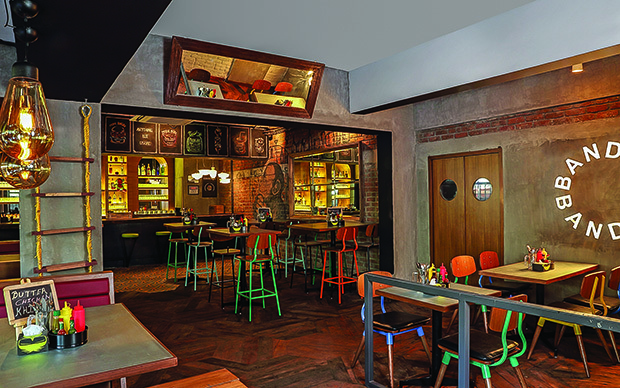 To carry forward the legacy of Monkey Bar with a similar semi-industrial look with a blend of local influence of Mumbai. Whiskey, passion fruit, mint and lime blended perfectly to make aÂ heady cocktail. An innovative dish involving molecular gastronomy with chaat served on a lit platter. The crisp cups were filled with potato, kala chana, tamarind chutney topped with a pani sphere that is not only colourful but equally flavourful. A dish made from a Rajasthani lamb preparation stuffed in miniature rotis acting like tacos. The braised lamb mince is mixed with mirch achaar mayo, ker sangri, onions and served with radish slaw and garlic – coriander chutney. A typical Kayasth-style preparation of mutton cooked with whole spices and lotus seeds. The dish is served with small gobindobhog rice from West Bengal. An interesting seating space with quirky chairs. Customized lighting fixtures on an angular brass arm that are a product of an artisan from Mumbaiâ€™s Chor Bazaar. The shabby-chic wooden bar counter and the swivelling stools form a perfect foreground to the shimmering bar unit. Inside, bold, quirky graffiti on exposed brick walls immediately convey the vibe of the restobar. The bar has a broad spectrum of seating to choose from. They include the comfortable chairs-and-table, the high bar chairs, the banquet bench seating for larger groups and swivelling bar stools.